Intestinal parasites are parasites that populate the gastro-intestinal tract. Human parasites especially parasites in the intestines and colon are actually fairly common. Parasites can get into the intestine through the mouth from uncooked or unwashed food, contact with pets and animals, contaminated water, larva infected soil, or by skin contact. People often think that parasites are from poor hygiene; however, there are many ways that parasites can be transmitted. Many people now travel to different parts of the world and can become infected with different types of parasites. Good hygiene is an important precaution, but is not guarantee against infection. There are over a thousand known parasites that can live in the human body at one time. It is estimated that as many as 90% of the world's population is afflicted with parasites. Some scientists believe parasites are responsible for diseases like diabetes, cancer, hypertension, liver dysfunction, and autoimmune diseases. Other symptoms of parasite infestation are: allergies, anemia, constipation, diarrhea, chronic fatigue gas and stomach bloating, immune dysfunction, and nervousness. Parasites live off the body and feeds on their nutrients, cell and organs. The parasite reproduces by depositing thousands of eggs, or replicating by cell division, with the body's tissues and cells. Parasites eat the body's cells directly or drain the best of the nutrients and amino acids directly from the body's tissue. These parasites also secrete their toxic wastes throughout the body, leaving their poisonous sludge behind to be reabsorbed by the body. 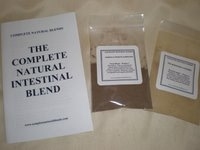 The accumulation of parasitic waste, continual tissue and cell damage, and the inability to effectively absorb necessary nutrients compromises the body's ability to maintain optimum health. Parasites can take so many different physical forms within their development. It is very difficult to diagnose through medical testing.